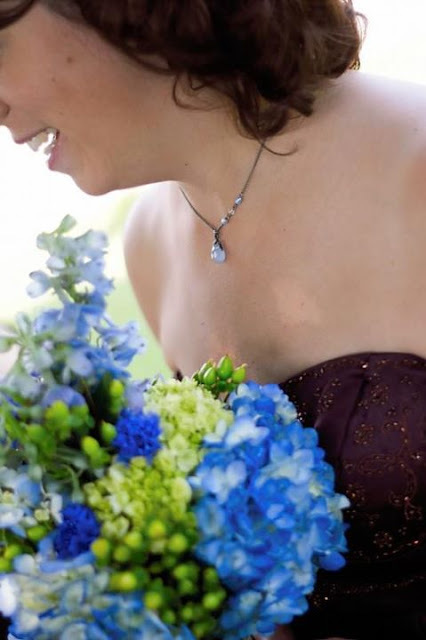 Alicia's delicate bridesmaid's pieces are blue chalcedony pendants asymmetrically accented with tiny sky blue pearls and Swarovski crystals on an antique silver chain. "Truly, the necklaces you made were one of my favorite details of the wedding. I could not wait to give them to my bridesmaids! Thank you so much for working with me to create something so perfectly to what I had in mind! I'm so glad that I worked with you!" Alicia was a pleasure to work with too, and we were delighted to see how perfectly the bridemaids pieces reflected her on her special day. 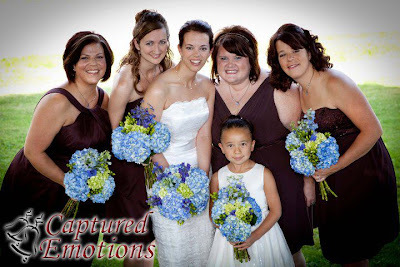 The excellent wedding photography was done by Captured Emotions Photography. Click here for more samples of our custom design work, and here to contact us for more information. We'd love to work with you on you're perfect custom wedding jewelry!